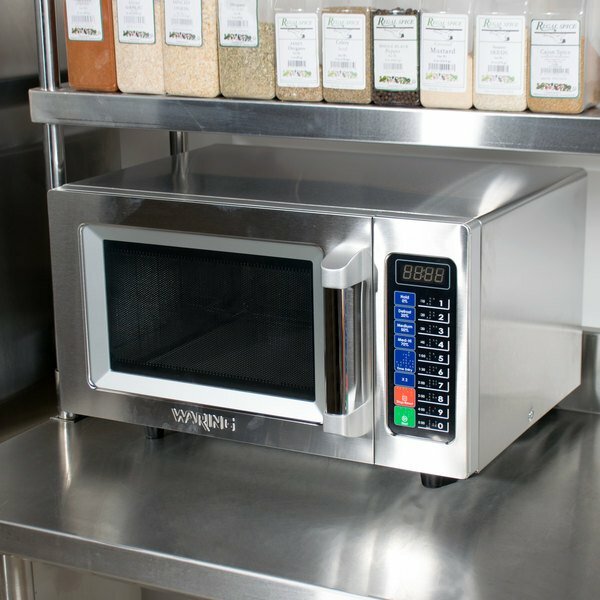 Boasting a durable construction and space-saving size, this Waring WMO90 stainless steel commercial microwave with push button controls is a must-have addition to any standard scale food operation. With 1000W of power, this compact countertop appliance can quickly and efficiently cook sandwiches, soups, pre-packaged lunches, and more! 5 built-in power levels such as high, medium-high, medium, defrost, and hold combined with multi-stage cooking technology accommodates a variety of food types and tasks. Users can cook food items with different combinations of time and power levels by using the 100 different programmable settings to create as many as 10 recipes. These recipes can be accessed with just the push of one of the memory pad buttons and allow even inexperienced employees to cook your most popular foods to perfection time and time again! 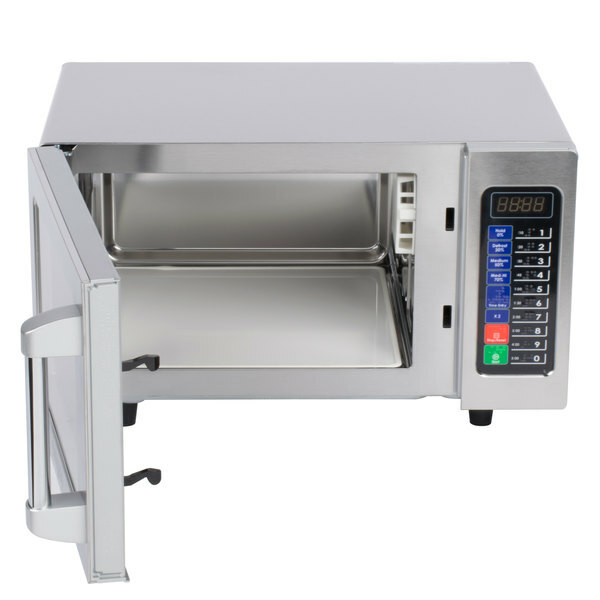 The 60 minute max cook time assures that virtually any food you put in will come out completely rethermed, while the push button controls make this microwave user-friendly and include Braille to accommodate those with visual impairments. 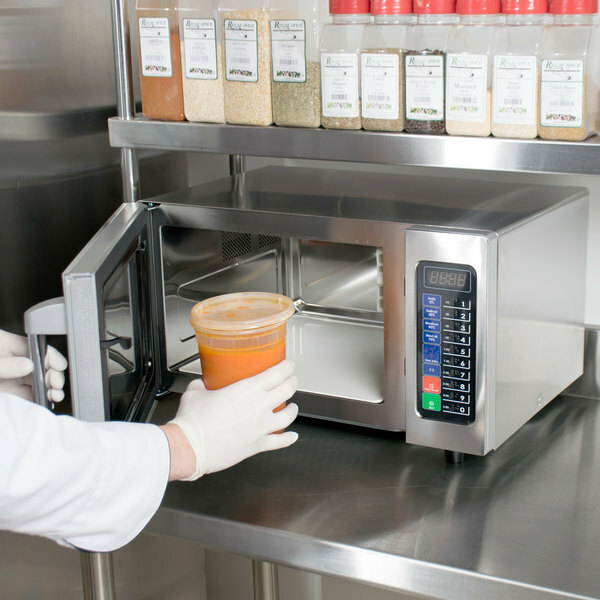 An interior light allows you to monitor your product without stopping the cooking process. The polished stainless steel construction allows for simple cleaning and maintenance, plus it adds visual appeal to your kitchen or break space. This Waring WMO90 unit requires a 120V electrical connection. Very economical solution for the need of having a microwave. We do not use it a lot, our needs may not be as great as others, but it is easy to operate, and is very efficient. Bought this last year to replace our existing microwave once it stopped working. Functioned well for about a year, then died out of the warranty period. Spent a few extra dollars on this model since it was listed as "medium duty" but I wouldn't consider it any better than an off brand light duty item. Before this microwave, we had a household one that sounded like a plane landing in the kitchen. This has been just fantastic for our whole crew. 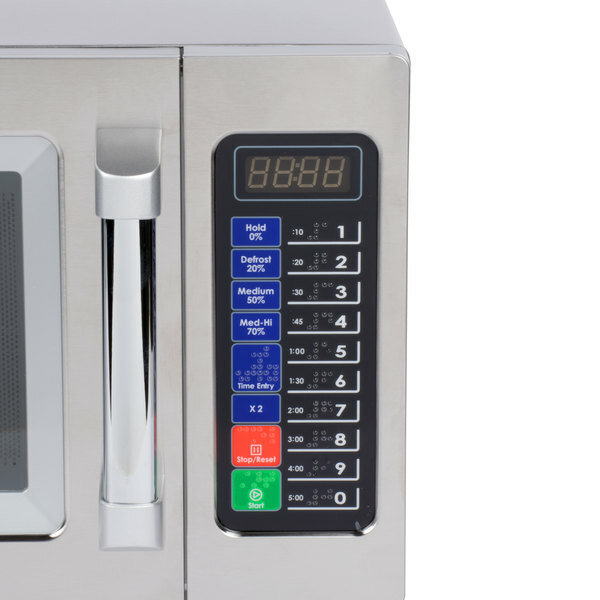 Not only is it silent, but it is easy to clean, easy to move around, and easy to operate even if you have never used a commercial microwave before. This piece of equipment was an amazing investment! The Waring has one feature my staff love. When you press power level the unit starts cooking at once. You do not then also have to press a start button. The Waring WM090 seems to manage moisture better than the Vollraths. So Waring can do more cycles without slowing down. I plan to replace my Vollrath 3 units with Waring as they need to be replaced. Perfect Little microwave. The size made this a perfect fit for our kitchen. Was a replacement for a standard household microwave. We will be looking at this item again when we open other stores. This unit is a perfect light duty microwave for use in our nightclub. 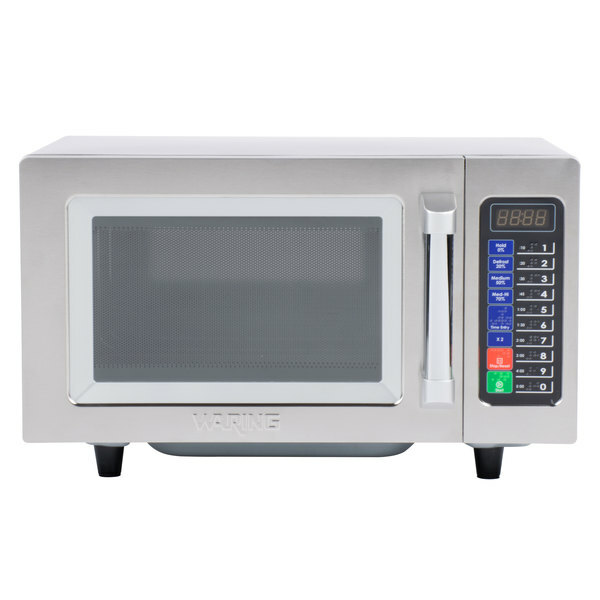 The panel is easy to program and use and the microwave works exceptionally well. Very aggressively priced. Well below the local supplier. Purchased this Microwave for use in our concession stands, low usage areas. Installed one to see what we think. All they do is quick thaw pastries and similar items. Unit lasted just short of two months. We are currently waiting for Web restaurant store to contact Waring Warranty service to see what to do with the non functioning unit. This Microwave appears well built and we liked the ease of operation when it did work. I would steer clear of this unit . I will revise this review once we have gotten through the warranty process. Could really use a higher sense of urgency from the Waring company. We will have to go purchase a microwave locally to hold us until this unit can be replaced. Thank you for the review, Norm. We are sorry this microwave did not last as it should have. Our Customer Solutions team will remain in contact with you until the issue is resolved. 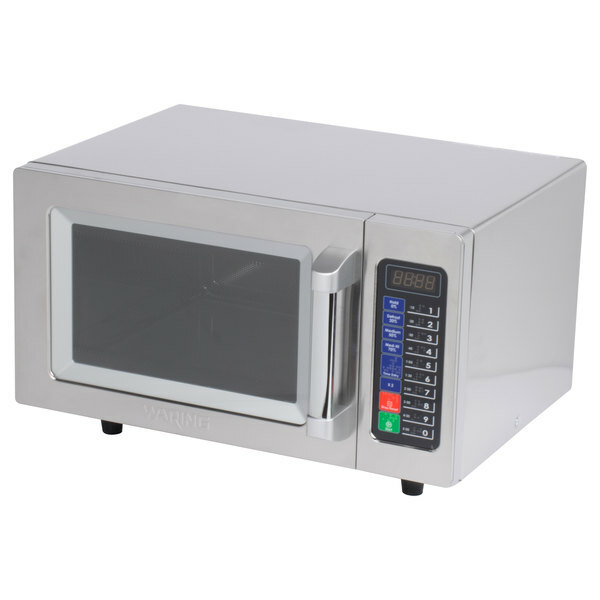 Really nice compact commercial microwave, easily fits a full 11" dinner plate. Large no-nonsense handle to open the oven. Stainless inside and out, nice looking, easy to use and really easy to clean ceramic bottom where the food sits. Easy to program items like how loud the beeper is when done cooking or turn it off. Other brands do not allow this to be set and can be so loud it will blow you out of the room when done. No carousel needed for these commercial types because they stir the microwave energy rather than moving the food and the energy comes from just under the food rather than the side as most consumer models. We have other Waring Commercial products and they are all of excellent quality. Still not made in the USA but this is the best we found after a lot of research. Very few reviews available on this model because it is new and just started shipping a few weeks ago. Would recommend to anyone.